IBM’s a big fan of Corporate Social Responsibility (see our 2013 report) effots, but even if the company I work for wasn’t such a fan I still would be. Yesterday we ran a social media workshop, called Marketing Matters, for charities local to Edinburgh. It’s run in locations around the UK by various volunteers, and tends to get really positive feedback. You can read more about it at the IBM website. I was asked by a colleague if I would blog about the day, which I immediately agreed to, but on further contemplation it’s a whole day of learning so there could be a lot to include here: not so much a blog but a book! So, I thought I’d blog based on the tweets I had chosen to post because I thought the points made were important. What’s your brand? We started by considering some famous brands, the enduring idea behind them, how they differentiate themselves, how their target demographic experiences that brand and what that demographic is. The idea here is to start thinking more about how the volunteer, fundraiser, recipient, or other person experiences the charity. Disney and Apple are two good brands to think about here; can you work out what their enduring ideas are? Don’t Get Left Behind. When we started to think more about demographics, the people we want to engage using social media, there was a lot of discussion about who is on twitter and other social networks. My gran is 91 and she uses facebook because it’s a great way for her to keep up to date with the family, so we can’t necessarily make too many assumptions about who does use social media. I was about to type “there will always be people who shy away from twitter” but that may be a little too assumptive. However, it is probably quite likely. There will be some people who choose not to use certain social networks, but the world is increasingly moving towards them. These people can be a great source of funding – as per the bare-faced selfie for Cancer Research, and the ice bucket challenge for ALS (MND) – and it would be a shame to miss them. But we also talked about one target audience of volunteers likely being recent retirees who may have some time on their hands. Perhaps LinkedIn would be a good place to find them given in recent years a large number of people have signed up to that social network for business purposes. Follow, Listen, Act. Getting started in social media was a bit daunting for one or two in the room, and certainly experience varied across the different social networks. We discussed that there is often nothing wrong with getting set up and, certainly from a twitter or instagram perspective, just starting to follow people or organisations we think could be interested in our own charity, have similar purposes, and so on. “Listen” – which is really “read” – for a while and take in what is being said. But don’t let that “while” be too long. Start posting updates about what you are doing, start retweeting salient tweets, replying with an opinion. Time constraints mean I have to continue this later… watch this space! As I’ve mentioned in a couple of blog posts recently, I was fortunate enough to have the opportunity to talk about how Social is Changing the Future to an audience made up mostly of students at the TEDxUniversityofStrathclyde back in May. What bemused me is that underlying all our talks – without any of us conferring in advance – were principles of social. After a brief introduction about social not going away I focus on how social enables hypersonalisation so that we are sold to (putting it bluntly) in a much more relevant way. I then follow up with how social behaviours are now enabling a new approach to trying out new ideas, and that failure may be an option in a way we perhaps had not predicted. The whole thing is about 10 minutes long. 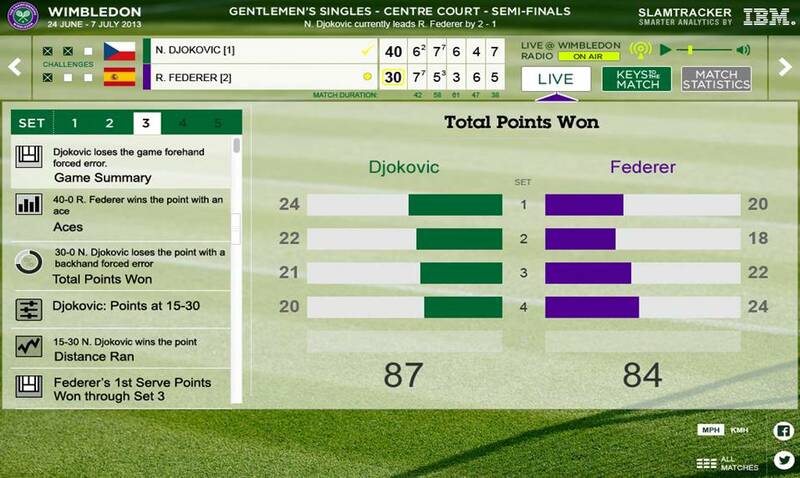 In a previous post I was thinking about some of the exciting things we do with Wimbledon, and I thought it might be useful to add some practical applications of social and analytics in other industries. I’m not going to talk about Big Data. If I’m honest I don’t really like the term. To me there’s just data. And there’s an abundance of it, some of it we own, some of it we don’t but we do have access to, some of it is highly accurate, some more questionable. There are many types we can make use of, from a variety of sources, in many shapes and sizes. And a lot of that data can be from social media and from social business platforms – that is, from systems of engagement. When that data is analysed it can allow you to do something you were already doing but do it better – because you have a better understanding. It can allow you do something you weren’t doing but is related to a strategic objective such as understanding customer sentiment to become more customer centric. It can even allow you to do something truly transformative such as real time traffic flow optimisation, as is done in Dublin. There the city uses data to identify and solve the root causes of traffic congestion in its public transport network. This means they improve traffic flow and provide better mobility for commuters. Data is taken from a citywide network of sensors, bus timetables, cctv and combined with geospatial data and the gps updates transmitted by the city’s 1000 buses every 20 seconds. Using this, the traffic can be monitored and managed in real time by those who have the responsibility in the city. Based on the success we are now working on projects with Dublin and our Research organisation to add meteorological data into the traffic control centre so actions can be taken to reduce the impact of severe weather on commuters. We are also developing a predictive analytics solution which will combine the city’s tram network with electronic docks for Dublin’s free bicycle scheme. We tend to divide analytics into three categories although there are other ways to do it. Those are descriptive – what happened, predictive – what is likely to happen – and prescriptive which not only anticipates what will happen and when it will happen, but also why it will happen, and suggests decision options to take advantage of the predictions. I see a lot of organisations do the descriptive analytics, whether using more intuitive and interactive dashbords or just, dare I say, excel spreadsheets. Fewer are taking advantage of predictive, and even fewer prescriptive. We can predict and act on the intent to purchase. It’s possible to identify what customers are researching and send this information to human and online channels. The SlamTracker keys to the Wimbledon game are based on prior player performance, and we can similarly understand customer behaviour and predict likely purchases. We can truly personalise our interactions with the customer. System U within Watson – needs just 200 tweets to understand an individual’s wants, needs, psychological profile, emotional style, and so on, and this – combined with any other data we may have about a customer – can allow us to tailor the right message for the right customer at the right time. I talked about this at the TEDxUniversityofStrathclyde recently. IBM helps Thames Water analyse a range of social media channels including blogs, online forums and Twitter to create real-time public opinion snapshots, identifying trends and usage behaviour while understanding how consumers feel towards the brand. But we are taking that analysis one step further and working with other water companies around the world to determine where there is a leak in the infrastructure using social media as a feed. In Toulouse they use social media analytics <French site> to understand where they have a problem with their road infrastructure – pot holes to you and me – and they’ve cut response times down from 15 days to 1. In the Netherlands and the US we’ve applied analytics to social media to understand the likely success of programme and film launches, and to take direct action to change the outcomes. For Wimbledon data and insight is crucial to the fan experience. The same can be said of all business, replacing the word “fan” appropriately – “employee”, “consumer”, “citizen”, and so on. Why has social technology worked? Today I had the honour of talking at Dundee’s Women in Science festival. I had picked the subject “What is the Millenial Virtuous Cycle?… and other social impacts”, with the “Millenial Virtuous Cycle” being a rather interesting cycle of innovation being predicted by IBM Research in this year’s Global Technology Outlook (link to 2013’s report) as will become standard – or more standard – in the next five years. But I introduced the topic by talking about why social technology has been successful, and that there’s a place for social technology for everyone, or rather, for all types of people. I started by considering Maslow’s Hierarchy of Needs. The first four needs – physiological, security, friendship and love, esteem – are in way the more important for if we the fundamental physical needs are not fulfilled we have physical problems, and if the three on top are not fulfilled we tend to become tense and anxious, have psychological challenges if you will. Friendship and love is interpersonal and concerns our sense of belonging. We humans need to feel acceptance amongst our social groups, regardless if these groups are large or small. If we don’t feel love or belonging we can be lonely, anxious and even clinically depressed. 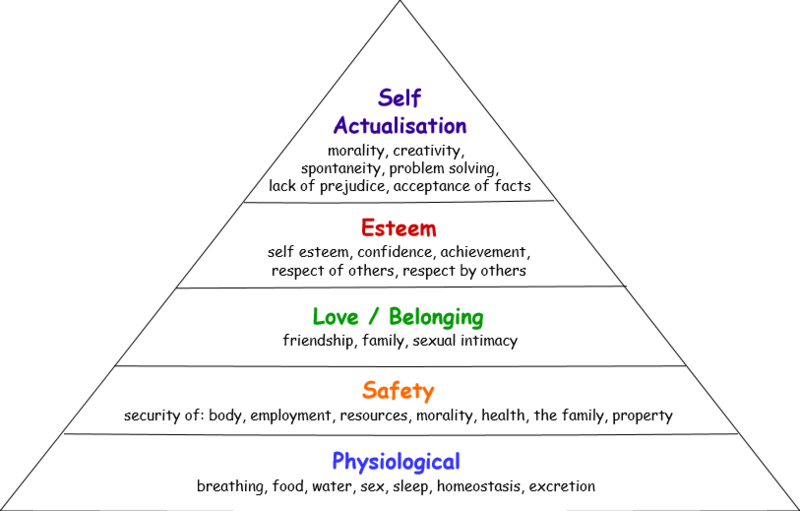 Maslow stated that this need for belonging could even overcome the physical and security needs depending on our culture, the peer pressure placed upon us. For those who find face to face conversation difficult, or just don’t have people like us around us, social technology offers us the ability to form different social groups than those physically around us. And for those who find face to face conversations a breeze, well, chances are we like engaging with others in many ways and so social technology offers us yet another way to connect. Esteem is our desire to be accepted and valued by others, we need to feel resepcted and this includes the need to have self esteem and self respect. We have a profession or vocation (which perhaps could be more than just a job) and have hobbies in order to get that recognition, to feel like we are contributing, making a difference event. People with low self esteem often need more respect from others and may even want to seek fame or glory. What easier way than twitter?! Again, though, one doesn’t have to have low self esteem to consider using social media, but I can’t remember ever seeing a tweet that said something like “oh, no, not another follower”. So, perhaps social technology allows us to meet those fundamental needs. But also, my attention was drawn to a new Harvard report “Disclosing information about the self is intrinsically rewarding“*; so called because that’s exactly what they concluded. It starts by telling us that studies of human conversations demonstrated that approximately 30-40 percent of our everyday speech contains information about our private experiences or personal relationships. But surveys of internet use suggest that over 80 percent of social media posts are simply announcements about our own immediate experiences. It goes on to say that a number of commentators have argued that these unusually high rates of sharing could come from a motivation specific to humans to share our beliefs and knowledge about the world. As you’d expect from such research the team required empirical support to prove their hypothesis and so they used five studies with a combination of neuroimaging and cognitive methods. And they did conclude that we humans are motivated to share what we are thinking (or “propagate the products of their minds” as it is more eloquently put in the article), and that opportunities to share our thoughts should be experienced as a powerful form of subjective reward. We like sharing and social technology helps us doing that. Which leads me to think, so maybe knowledge is power, but is it more powerful if it’s shared?